Sadly, it only exists in the virtual world. Racing game fans are no doubt rejoicing that the hotly anticipated release of Gran Turismo Sport is now just around the corner on PS4 after years of waiting. It’s a pivotal franchise not only for Sony as the best-selling series on PlayStation, but also car manufacturers. With such a wide audience reach, having your car in a Gran Turismo game is a big deal. Developer Polyphony Digital’s close relationship with manufacturers led to the Vision Gran Turismo initiative, allowing automakers to dream up extreme concept cars to be playable in the video game series. With the latest game’s release drawing closer, Vision GT is getting back up to speed. Zagato recently teased its upcoming Vision GT car, and now McLaren has revealed a surprise entry with this: the extraordinary McLaren Ultimate Vision GT. Before you get too excited that its striking look is previewing McLaren’s future design direction, the automaker insists that this is not a prototype for a future model, rather a showcase of what a McLaren GT race car could potentially look like in 2030. The dramatic design isn’t just for show: like McLaren’s road cars, every feature serves a purpose in-line with the company’s “form follows function” mantra. The teardrop cabin and extensive glazing increase the visibility. Being driver-focused, the unconventional seating arrangement has the driver not only centrally positioned, but led on their front with the rest of the car “shrink wrapped” around them. “The design form communicates exactly what the car’s mission is and what its intentions are: it’s the ultimate expression of the McLaren design pillars and principles we have already established, futured into the 2030s,” said Rob Melville, McLaren’s Design Director. Power is sourced from a hybrid powertrain with a twin-turbo 4.0-liter V8 driving the rear wheels and a pair of electric motors housed in each of the front wheels. Combined output is 1,134-hp and 940 lb-ft of torque. 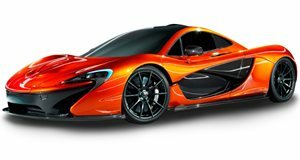 Lightweight carbon fiber is used extensively in the upper structure and body of the McLaren Ultimate Vision Gran Turismo as well as in the chassis, keeping the weight down to just 1,000 kg. It also features ultra-advanced active aero technology. Called Integrated Active Aero, it uses tiny aperture around air inlets on key surfaces during cornering rather than moving the surfaces altogether, to create drag and generate downforce. “For me, a car needs to be an extension of the driver; I am focused not just on the appearance, but on the handling, the sound of the engine, and the feeling you get when you are racing,” said Gran Turismo series creator Kazunori Yamauchi. “So, it was an honour to work with McLaren to bring the Ultimate Vision Gran Turismo to life, and to put such a car on the circuits of Gran Turismo Sport for players to enjoy driving at the limit.” Sadly, the McLaren Ultimate Vision GT only exists in the virtual world. The only way to experience it will be in Gran Turismo Sport on PlayStation 4 when it launches on October 17.